Tonight at the University of Illinois at Chicago, the lead-up to the Under Armour All-America Game first made a stop at the home of the Flames with a player workout at UIC, hitting, pitching and defensive drills and other fun activities in our Day One recap. Thomas Dillard tests out the GTP App. 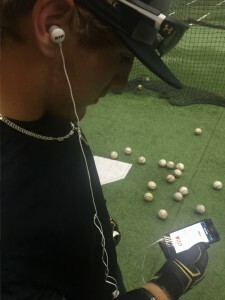 The players also spent time trying out the new Game Time Pressure Training App, designed to help players overcome game-time stressors and better transfer his skills from practice to a real-game situation. All-Americans also got a chance to test out the Ripken Performance Metrics or RPM, which introduces quantitative measurements of a player’s ability to generate outs on the field and to create offense at the plate. After the workout, the players participated in a Home Run Derby qualifier with the top hitters advancing to the Finals on Saturday afternoon before the All-America Game. On the National team, both Andrew Yerzy and Bo Bichette both advanced, hitting six home runs. One of Bichette’s home runs to left field hit the light tower, some 25 feet in the air. On the American side, both Joey Wentz and Will Benson put on a show, pacing the leaders as Wentz hit 10 bombs and Benson awed the crowd by knocking 11 out of the park. Still to be determined are two-to-four more participants to round out the Home Run Derby Final at Wrigley Field. Tomorrow, the All-Americans will participate in a Under Armour giveback program, stuffing backpacks and playing stickball before heading back over to UIC to workout for scouts and then head to Soldier Field in the evening for an awards banquet and jersey presentation.